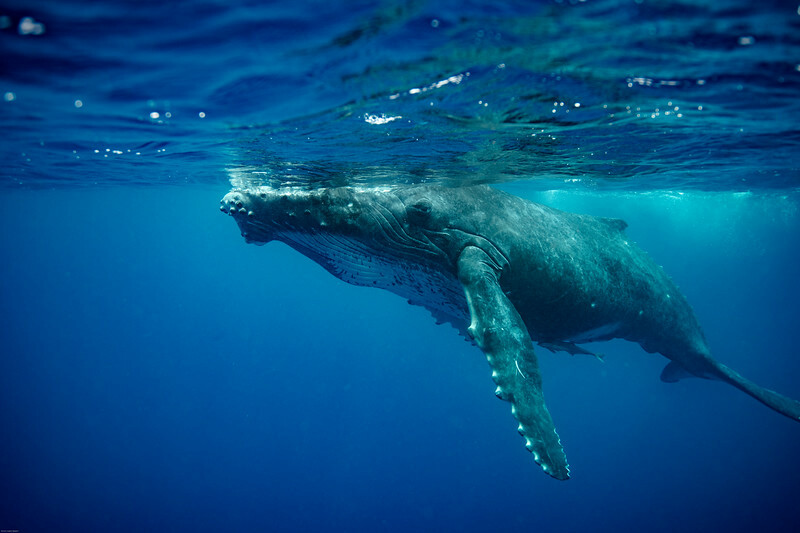 TONGA - Vava'u: Flying 17K Km to the other side of the planet to swim with Humpack Whales might be consider a bit stupid, dangerous and irresponsible. It certainly requires a considerable amount of planning. Yes, planning! From Italy to get to Tonga it requires about three days depending on the rout you take. There are no shortcuts, it is a long way to get to Vava'u, you might land in Tongatapu frist or flight strait from Fiji to Vava'u, at a cost and not necessarily a monetary one. In the first case you unevitably have to face bagage restricions and in the second one you might have issues with your luggage. The chances to get your holiday screw by an airline are superhigh! Vava'u is a remote, beautiful, island with a friendly population which percapita income is below 5K USD per year in the middle of the pacific. It is green, you can find vanilla, banans, some vegetabels, insects, lots of insects and nothing much more than that. All the photograpfhic equipment, and snorkeling equipment has to fly with you, including spear parts or things that might get lost at sea. For Humpack aficionados Vava'u becomes the center of the universe from late june till september and everyone flys with bulcky suitcases that can't fit all at the same time the cargo area of the small ATR's that are allowed to land in Vavau international airpot. Please do not get me wrong, simply it is very very hard to find specific things, a part from that, Vava'u has everything that comes in by air or most likely in the commercial yard and a cargo bay, you will not starve! Sometimes they run out of refinded products such as fuel for boats, but first needs are all there and if you got organized you will be all right! We start planning our trip to Vava'u more than 15 months ahead and decided to contact Tony Wu, awarded Wildlife Photographer of the year in 2017 in London for the picture "Giant Gathering" of Sperm Whales. Tony took care of everything locally as he was studying humpack whales and running photographers trips for the season. Tony, a former banker, is superknowlageble in marine nature and in whales in particular! We feelt and feel super lucky to have met him and his wife Emi and have had the opportunity to learn about whales behaivour. In preparation for the trip we had to swim for months to get use to the phisical effort. The morning of the 30th of august, the moment of truth, our first jump into the sea with a potential sighiting of a mother and a calf, arrived we were not sure about gear,fins, mask alhtought it was all planned and trained my wife Nicoletta, panic! The deep blue of the Vava'u lagoon was too blue and the idea of seeing somthing scared her... I will always be thankful to Tony that took her by hand to live the "adventure of her life" as she later described it. I am proud of her and will always remember the experience Tony transimtted to us as he teached us how to swim with humpack whales. Nature comes first, by jesture or movment if you look carefully you understand what it tries to comunicate. Calfs are curious and males are always in a rush that time of the year... it was wonderfull. GEAR EXPERIENCE: In preparation fro the trip with more than six months ahead of departure I bought the NIMAR case for the D850, with the extension for the 16-35mm F4 lens to be able to capture the 18mt long mammals. The over 10kg mounted case with cristal dome was much more handy underwater than above sea level, but not small enoght for a quick swim in front of a heat rush. I decided to go for it because production and the service center were in Italy and my friend Massimo had use the brand before. I immidiatly figure out that despite not being advertise the camera could not turn "off" once "on" iside the case, a true issue and a hassle as humid areas during the day tend to form condensation in the case on a boat, often rocking, making the change of the battery impossible after 3 hours, that it is how long the camera battery lasted in stand by mode. On day 2 the dome lock lever snapped out of nothing, I contacted Nimar for any suggestions of a temporary fix given that I had 7 more days at sea, they were vague and did not not suggested any temporary solution; probably beacuse they did not want to take the responsability of watering the camera. Ian, the best mechanic in Vavau, resined the lever port, and with a trick I used the case for the rest of the holiday. The wet sensor was permanently "on" the entire trip despite the case been dry so I end up sticking a white tape on the dome port to see any potentaial turning of the port and avoid watering. Lifting on and off the boat the case was a good exercise, some times risky with high waves! Because of water conditions and the bulkiness while swimming in apnea I recomend to use a more compat casing with a wide fix angle and a aperture below F4. Melly, the local guide on the "Endengered encounters" alluminum boat and Tony always jumped into water first on a move that not always was easy with apnea fins, wetsuits, cases masks and lots of courage! Over the 7 days out we never had a day without suspension and whales at the same time, neither with mothers and calfs or during a heat run, non the less it was a great experience. Once home I returned the case to Nimar that changed the "on" switch to "on/off", the wetsensor, and the port ipoxed and replaced the leaver that had snapped suddenly. They did not charge for it and I thank Nimar for that. During the trip Tony was using a Nauticam, I had a chance to hold it and I like the Nauticam D850 more. The port lock levere on the Nimar has to be redesign and a safety has to be added to avoid accidental opening of the port just like the Nauticam. The Nauticam also is more compact and hydrodynamic. All the equpiment for the out of surface photography such as the d4 witht he 80 to 400mm was in my "check in pellican case" havey to carry around the hole trip but necessary to keep everyting dry at all times. Tony had hired the best boat in town from Endengered Encounters, the innercabin was a real change to keep things dry most of the time even if a drybag made the change to keep towels and jumpers dry. Mavic Air was the drone I decided to take on the trip, the resolution was pretty good, however I must admit that is very hard to control with wind above 10 konts, and ther is always wind!! The risk to drown it is very high! ACCOMODATION: My wife and I decided to fly in a day earlier from Fiji due to the above mentionned possible luggage issues and we booked one night at the Tongan beach hotel, a relatively clean plance with air conditionning and a very basic restaurant. We then moved to Paradise Isaland Resort ECO lodge, about an hour boating ride from Vava'u in the center of the lagoon, beautiful location, with a unique reef all around, sardins infront of the beach, trumpet fish and bonito were just there! Black tip sharks would hunt the sardins before sunrise and you could watch the seen from the deck. At first site an incredible place run by the owners Mark, a boat crafter and specialist, and Veronica, his Mexican wife, both beautiful people, incredibly warmimng. It was paradise unitl we realized that the cabins where infested by cocraches, termites, spiders, rats and there was nothing to do to get rid of them. We suffered every single night, we changed cabins to find one night cocraches running on me twice during a storm while sleeping in the middle of the night despite the bed nets. Sleepless and stressed my wife gave up looking for whales also because few weeks before departure we had discover that she had become pregnant and sea sickness was also an issue with waves 2 to 4mt high even inside the lagoon. During our stay we considered cutting our holiday half way through, but the eager to learn , experienace more whale whatching and photography kept us there until the end. By the way there aren't daily flights out, that my wife look for... Once at the gate Fiji airways announced that it had to leave bejind 6 people or 750 kg of luggage, we looked into eachothers eyes thought about spending 4 more days for a split of a second all paid, but declined to decline as we both retunred home with minor health infections. SPECIAL THANKS: To Tony and Emi for their frienship, their prescious advices and making it all possible. To Brenda and her crew for taking us safely around in the quest for whales. To Ian for fixing my case. SPECIAL REMARKS: Swimming with whales requires phisical preparation, the right equipment and lot's of patiance. Please take Nature in consideration when you do that and enjoy the experience as much as you can. CANADA - Nunavut Flying in winter from Europe to North America we often cross over Greenland, Canada, the Labrador coast before reaching our destination. Often, if not every time, looking down 30'000 feet from the window of the plane, I have daydream about how it would be to be in between the rocky mountains, the deep snowy valleys and the explanades where you hardly see where the land meets the iced sea. The Bears and Bergs trip was all about that and much more... You could nearly call it an Expedition, when you cover every inch of your skin from the tows to the top of your head to avoid any frost bites, you sleep in an Artic tent over 9 feet of snow, with wind constantly blowing and the temperarture of -35 degrees Celcius is a constant. It is certainly a challenge and some people just can't call it "Holiday". I unplugged off the coast of Qikiqtarjuaq. Andy Skillen toghether with Artic kingdom had put up this photographic expedition for which we waited almost 30 months as the first window in April 2017 had been cancel when my friends and I were already on our way to Ottawa due to the conditions of the ice as it was melting and the pac wasn't sufficiently thik. Yes the pac, it is all about ice, slushy ice, snow, pouder, deep snow, snow drift, and many other ways to call the cristals of water. Our guide Jay, a local fisherman and hunter member of the hunters and trapers local assosciation one evening recalled in less than a second at least seven different words for snow: apote, pukaya, mauya, kimutyu, mangomayu, kastokanayu, pascktu... and many more after for which translation to english doesn't even exists. You are probably wondering how was it possible to have a local hunter as a guide? Well... allow me to quote Jay to explain what is the North of Canada: "North is a place for Inuit. 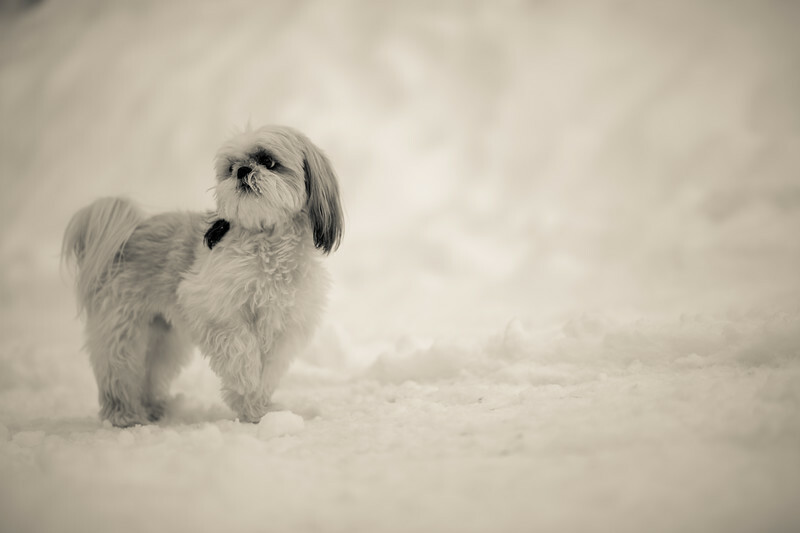 We are, We survive, We hunt and my heart is North! I wish people could understand how much this place, an animal, mean to me! I would never move anywhere else. I would never have a job in town, I would rather be here." 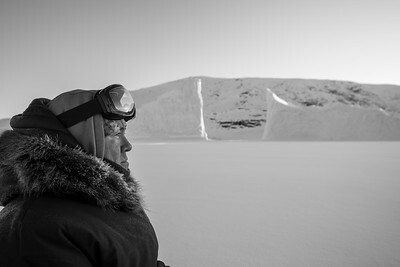 The North is a challenging place to live, I probably wouldn't survive a day out there withouth Inuit support. 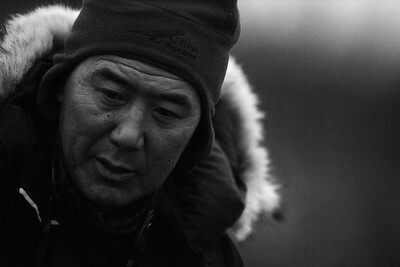 Inuit relay on nature and hunting for survival, the summer lasts only two months and it is impossible to grow any veggies. Airlifted food is very expensive when you consider that a 60 cents pop's can once it lands in "Qiq" is already 5 dollars due to the transport cost. Jay and their team support was crucial during the daily scouting activity in the quest for the mothers and cubs during our 7 days journey that included extensive rides on the back of a skidoo or on a bumpy camotec for hours. 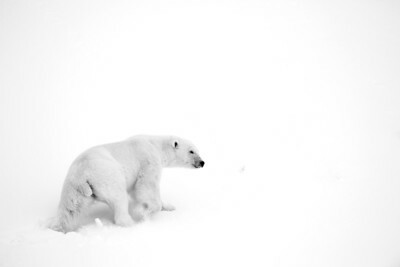 Most of the time we were on the sea ice, in the fiords at the hedge of Auyuittuq national park. Sightings were fast as bears typically like to keep their distance from humans, specially mothers with cbus. April is when mothers come out from the denning sights with the youngs and hunt for baby seals in the area before heading to the hedge flow to hunt. Our best chance of sighting was when they were spotted on an icberg resting. GEAR EXPERIENCE: Knowing the challenging conditions I packed all in a pellican case, a must given the bumpy rides on the iced sea. A D5 and D850 from Nikon where the bodies I took with me toghether with a 600mm F4 and the 200-400mm F4. 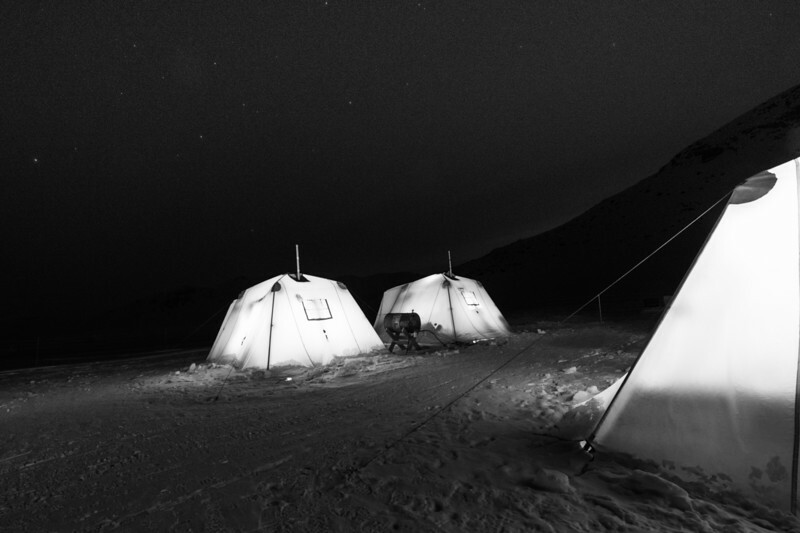 Often gear had to be prepared before leaving camp in the morning due to weather conditions. Snowflakes inside your camera is the last thing you want while you try to change frozen lenses on magnesium bodies with hand warmers and gloves on the way. From the early morning you have to have in mind what is the shoot you want to take and how to set up if you do encounter a bear, your options and time is limited. I also took with me a 12-24mm and the 70-200mm, that I did not use much given the distance from the bears that was often about 100m. I often used the TC 1.4x and 1.7x. The D850 had good resulution but the 40 mega pixel have a differen resoloution from the D5 that remains the best camera for white balancing and focusing at high distance from the Nikon range with low light. Andy had Canon and the D1 microfocusing just works perfectly when you try to pick a bear at 200 meters. Somthing I wish nikon had. Cleaning sensors in tents with a torch it is practically impossible, a friend with a sony struggle 3 days before managing to remove the dust. Good tripod and a Jimbal head are essential. Be prepare to breake things! Equipment goes under stress at -35 degrees, the 600mm locking colar mechanism broke while inside a pellican case, a ture mistery left the foot at 10 o'clock for the entire trip after day one. Hand holding the lens with the 1.4x converter on was a real challenge. The closest repairshop was in Toronto right behind the corner. SPECIAL THANKS: To Andy for his frienship! To Soren and Egle for the great time spent toghether looking for bears. To Jay for taking around a "flying Mexican" and teaching him as much as possible about Inuit life and bears. SPECIAL REMARKS: The bears and bergs expediton was an adventure that if I could I would do over and over again. It is a challenge not for everybody, condtions were extream in some circumstance, I thank the team that made it possible. Despite placing an order a week after it was annoucned the D850 arrived in Italy only two days before Christmas for an unboxing under the tree. We took it to the dolomites for a test. Seiser Alm - Dolomites since I was a kid the area has been one of my favorite destinations for skiing. The important snow fall over the past days has discriminated my time allocation between great fresh snow skiing and photography. Non the less this afternoon I took out D850. GEAR EXPERIENCE: I traded in my D800 for the D850 the change is sensible, the new body addresses a new segment of photographers between high demanding amateurs and professionals that do not feel like carrying around 1.4 kg of a D5 and do not want to give up on almost any of the best in class camera featuers and prefer to carry around 1 kg. Essential, ergonomically speaking the Body higlilights the versatility of the D5 in a more compact version. The absence of the flash is a big change, and characterizes the body as professional. The 64 - 25600 ISO range however allows great photography without the light source. A tilting touch screen/monintor is a great plus for super low eye level pictures of wildlife. The new Nikon features 153 AF points on the Expeed 5 sensor fx format with 45.7 mega-pixels that allows great formats aloso in crop mode. The 7 frames per sec (9 with the mbd15) on a continuous shooting mode are a plus vs my old D800 (5) limit the use for sports and wildlife action where the D5 remains in my opinion unbeatable with low light conditions. The White Balance rassembles very much the best in class just like the braketing options. 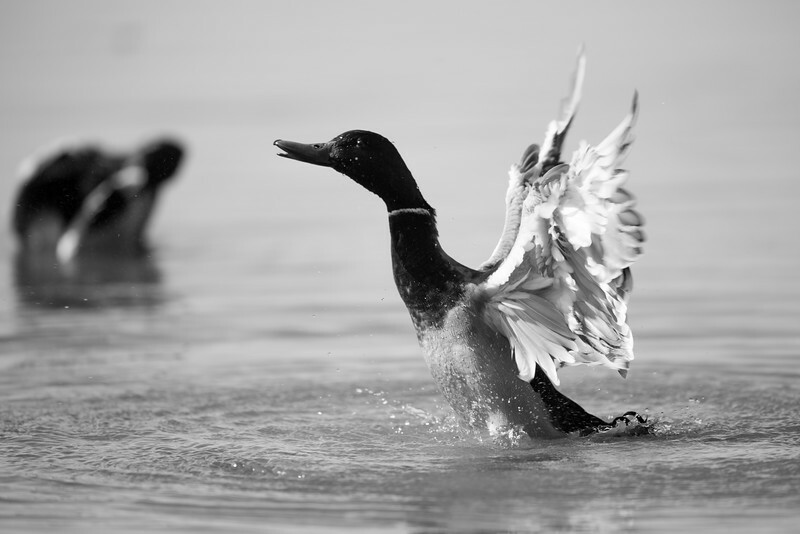 The extra Fn button on the body vs D800 gives further flexibility in personal settings that professionals like very much! The new D850 is not cheap compared to the D500 or the "amateur" Nikon range but is a great introduction to the professional series thanks to its flexibility. Under that point of view is a clear winner in valure for money terms. QUALIFYING SESSIONS @ Autódromo Hermanos Rodríguez: With the Constructor championship already assinged Sebastian Vettel kept the Tifosi dreams open with the pole position 1'16"488, followed by Max Verstappen, on Red Bull, and Lewis Hamilton on Merceds that during qulifiyng sessions seem to feel the pressure avoiding cameras as much as possible. "THE ACCIDENT IN TURN 2": Max Verstappen had nothing to loose while Sebastian Vettel had to win to have any chance left. Porbably with that in the back of his mind the German driver felt the pressure in the second corner when the Red bull was head to head with his Ferrari. The adrenaline, the pressure and the eager to win caused a reace accident never really investigated by Charlie White as the "show must go on". Vettel destryed the front of the car that had to be changed the next lap afther the puncture of the Pirelli wheel of Lewis Hamilton. Overtaking is difficult in Mexico city, with aeordinamics also affected by the altitude of the circuit. 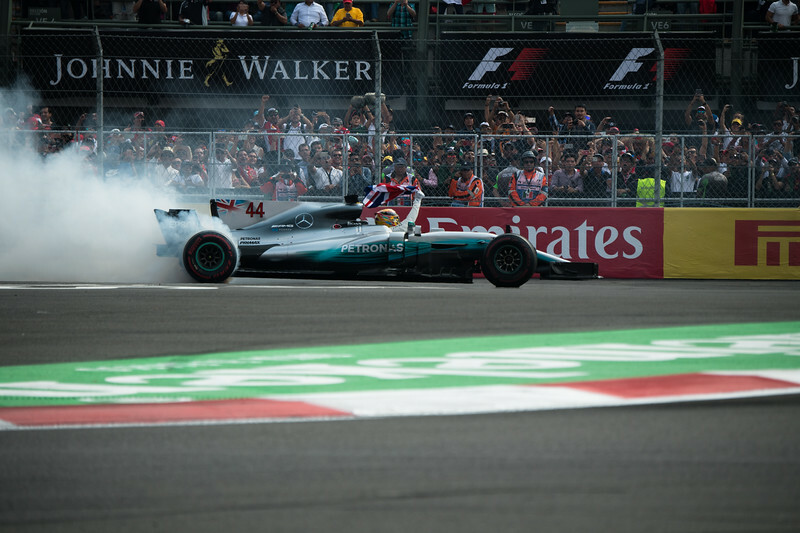 The math to the championship lead strategy of the race between the two champions as Vettel reached fourth place, Hamilton did the minimum finishing 9th and winning the pilots championship. Max Verstappen confirmed to be a winner and a pilot with wiht the Red Bull sideslipping some corners and having great fun in doing it. GEAR EXPERIENCE: A D4s and the D5 from Nikon were in my bag to attend the grand prix, toghether with a 24-70, a 70-200mm, a 80-400m and a 1.4x converter. The most used lens was the 70-200. 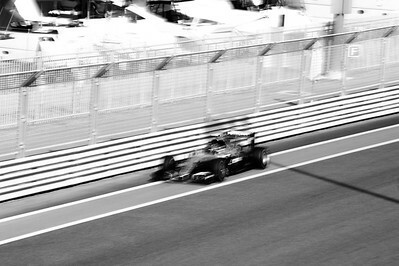 Panning shots were a fun challenge. Ultrasharp pictures above 3200th of a sec. 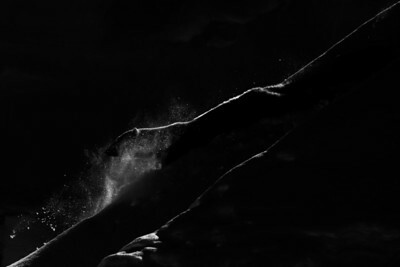 Light was often too strong given the daytime progrma of the competition. SPECIAL THANKS: To Brembo racing team and Andrea. UNITED ARAB EMIRATES - ABU DHABI: Twenty races in 2016 and yet here we are at the last race of the season and the drivers title to be asigned. 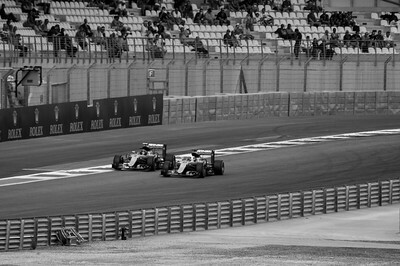 The Drama that is about to consume can be felt also this Thursday as the teams are in the box an the two Mercedes contendents unseen in the paddock... My memories of this motorsport go back in time to Suzuka 1990 to find the same pathos... it was the rivalery between the two McLaren pilots Ayrton Senna And Alain Prost at the first to last race of the season that year. 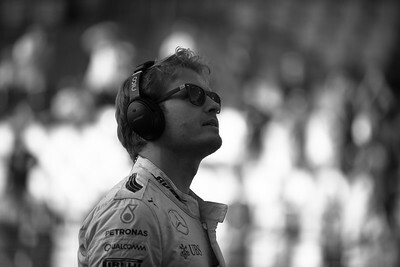 A magic moment that defined my passion for formula one. 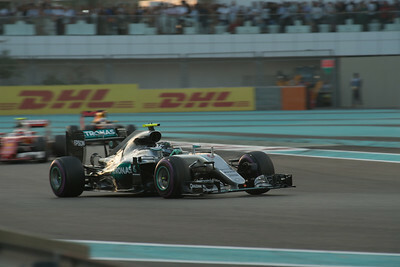 QUALIFYING SESSIONS @ YAS MARINA: With the Constructor championship assinged for the third year in a row to Mercedes, the Yas Marina, is the theater for the final clash between Nico Rosberg and Lewis Hamilton! 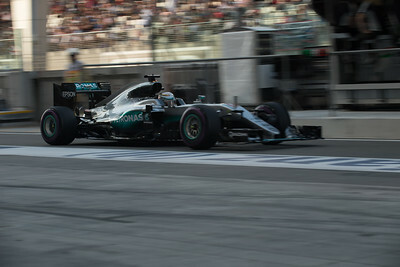 Qualifying laps under the torrid sun ended with Lewis Hamilton in first place with 1'38"755, confirming the won Pole Positions title in the season, followed by Nico Rosberg, leader of the drivers championship board with just 12 points ahead Pole man and Daniel Ricciardo on Red Bull 0.8 secs from first. Followed by the two Scuderia Ferrai pilots Kimi Raikkonen, Sebastian Vettel and the revelation of the year Max Verstappen on Red Bull. "LET US RACE": With Hamilton in first positon on the grid and 55 laps to go, the math was in the mind of every fromula one fan. 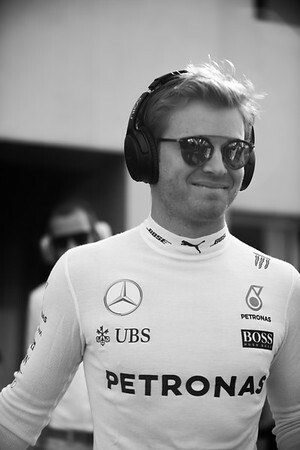 Rosberg had to either overtake the team mate or arrive second. The rest did not count. Ahdead of start both pilots were extreamly tens. The Race started and as the sunset was hitting the marina Hamilton left the rest behind until the pit stops were all almost done and Rorsberg had overtaken with certain precaution Verstappen then Hamilton started to slow down and Vettel homed in on Rosberg in the closing laps. 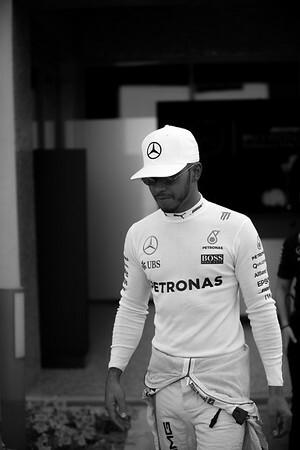 Mercedes on the radio: “Lewis this is an instruction, we need 45.1 for the win.” But Hamilton replied: “I suggest you just let us race.” In one of the must rare occasions we heard Mercedes executive director (technical) Paddy Lowe: "Lewis, this is Paddy. We need you to pick up the pace to win this race." 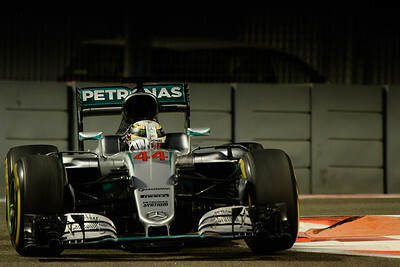 Hamilton replied: "I'm in the lead right now. I'm quite comfortable where I am." 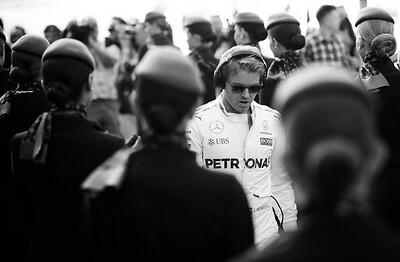 That was it, the drama was on, in the head of the leader of the race. Corner after corner we see them giving their best to be first sunday after sunday. We occasionally get to know what comes accros their minds while they are living their lifes at full speed. 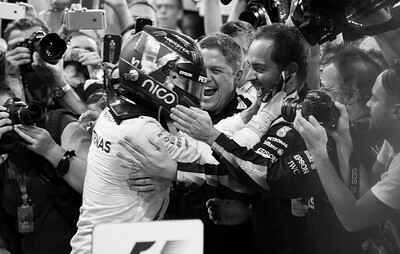 Hamilton words a few moments after were a glimpse in the most memorable race of 2016:“Right now I’m losing the world championship, whether I win or lose this race.” A few minutes after Hamilton won the Race and lost the Championship to his team mate Nico Rosberg. Vettel arrived third. 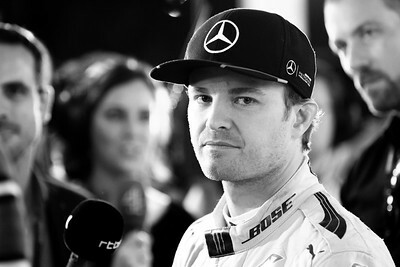 NICO ROSBERG retired 5 days after. GEAR EXPERIENCE: A D4s and the D5 from Nikon were in my bag to attend the grand prix, toghether with a 24-70, a 70-200mm, a 80-400m and a 1.7x converter. The most used lens was the 70-200. 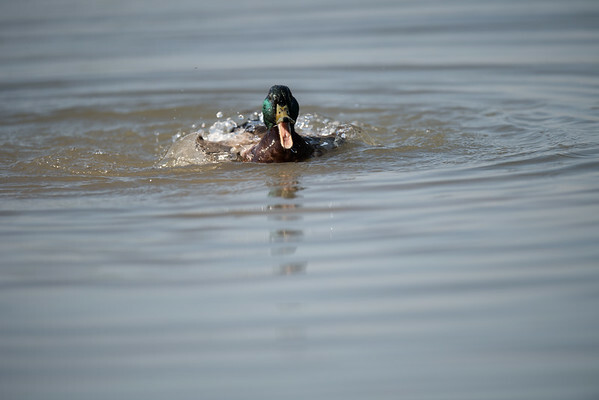 Panning shots were a fun challenge. Ultrasharp pictures above 2000th of a sec. Light was almost never a problem wiht the circuit illuminated like day time. SPECIAL THANKS: To Andrea and the Brembo racing team. 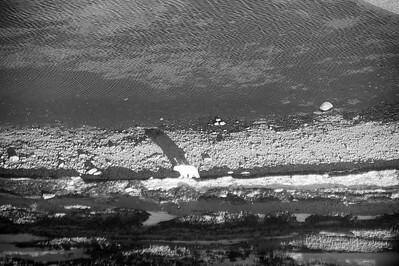 CANADA - Last frontier: Flying north from Churchill for about 1 hour, from the window of the plane we could see that the bay had not frozen yet. There were only a few white paches over the brownish horizon next to the coast, however it was a good start... 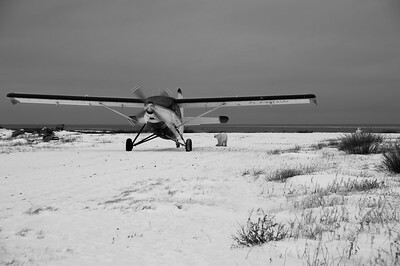 The plane had not even landed at Seal River lodge from Churchill Wild that at the beginning of the runway there was a young bear about 3 years old right next to Andy, sentior guide, and Mike, owner, waiting for us and another great white adventure. Just inside the freshley renewed and more spacious living room built last winter, Jeanne, ready with some tea and bisquits was waiting for us and the others to arrive. The veiw over the bay from the extra wide windows was just incredible while the tide was going out. It just felt like being back at home. It was great to be back. The five days with Mike, Andy, Derek and the staff simply flew as bears and a young timber wolf passed near by the lodge. Temperatures during the stay at Seal river were between -10 and plus 5 degrees Celtius, considerably worm despite the season... During our great walks along the cost line, over frozen lakes and the tundra young bears and Bob showed up, active but not super avtive given the warm weather... Afert visiting, I,II,III Bearpoint, on multiple occasions it was time to say good by to Bob. Ian and I had a quick stop in Churchill before Flying South over the Wapusk National Park to the delta of the Nelson and the Heyes rivesr befor heading east along the coast to Nanuk lodge. A special place that sits between the edge of the coniferus forest and the shore of the Churchill bay. At Nanuk had also just landed Eglea and Soren, two good friends with we sheared the March adventure earlier that same year. 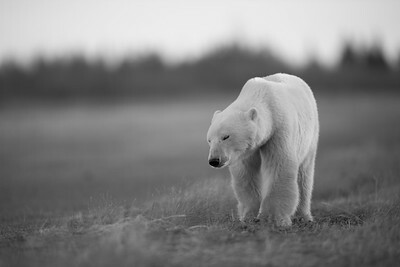 Being there in March with over 2 meters of snow and in November wihtout any white patches of snow was a different experience; white bears were much easier to spot as they were all on the shore line waiting for the bay to froze and ready to go hunting for some seals. Clearly they were hungry but I never seen so many bears all toghethere. One afternoon on the runway there were 14 bears, as I counted them that same afternoon I cried remembering how hard it was to look for bears last march. That same evening a pack of wolfs showed up and hunted a moose inland a long a minor river, we only found the next morning the carcass because as we aproched the site the wolfs were far gone. Moving around Nanuk is much easier thanks to the rino and the 4x4 that allow to cover greater distances and walks with all the gear are relatively shorter... Before leaving the last evening I had the famous carrot cake, I wish I had taken some home. GEAR EXPERIENCE: A D4s and the D5 from Nikon where in my backpack for this trip toghether with a 24-70mm, a 70-200mm, a 2-400m and the 600mm , this last one was again the most used lens as we aproched bears within 20 to 50 meters. Taking a pictures of a white bear is a challenge but do not forget to bring a tripod and a wimberly to save you some fatigue while waiting for the bears to move. White balance was not a great issue as the snow was not around yet. SPECIAL THANKS: To Ian and Albert that one morning coragously scared back a young curious bear infront of the lodge gate while I was busy taking pictures right on the runway. Congratulations and thank you for making all this possible. UGANDA: With our imunization for the yellow fever done we landed on the north shore of the lake Victoria, Entebbe airport, were we cleared our East Africa Visa (100 USD) and had a night stay before flying to Kibale national park to meet the Chimpanzees in the Kingdom of Toro. The park is located in between harvested hills, forests, tee plantations and will be soon reachable by a new "dusty" road currently build by chinese. With an altitude that varies and can reach nearly 1600 mt above sea level has an extention of 795 square kilometers and is home to about 1500 Chimpanzees, the largest population in Uganda along with 13 other species of primates that live in the area. From what we could see vegetation varies from rain forest, to dry forest with nice and realtively easy paths to walk on in some areas. The next day, with the "habituation chimp permit” We access the park at about 6:45 and the Chimps were still in their nests…fifty to sixty mt above our heads.. the sun was already up but the day was cloudy and not super warm, 24 degrees, so except for the runner up male “Totti” sleeping on a log on the floor there was not much of activity until mid day when eventually with the sun high and warmer temperatures they came down of the threes. The dominant male is quiet old so the runner up is patrolling the territory, rather than staying on the trees most of the time he is the one resting at ground level and moving from one side to the other of the home range. We could say that the Tourist protagonist is him. we walked nearly 13 km mostly on trails that day, up and down, the territory of the park we visit was dry forest and a bit of wet forest in the valleys for most of the day. I soon relized thath the best photographic opportunities are when they are on the ground next to a path or a nice log and I would also add that in the afternoon when the day is warm and they leave the top of the threes for some shade. During the first day Totti used a branch from left to right to defend or scare us but on the day trek he probably got our sent and walked next to me comfortably close more than twice, then made his calls and used a tree as drum to call the other several times with a sound I wish I had recorded but will be in my memories for ever. At one point I was so tired that I took a powernap bracing my camera on the same log where Totti was sleeping, woke up and he was just looking... at me... Babies and subadults are super shy and nearly impossible to see on the ground. Around 4:30/5 in the afternoon we saw some chimps going to the top of the trees to nest and that was it for the day. I strongly recommend at least 2 visits for a full experience...Chimps when active are much more challenging to photograph with low light conditions… their cruising speed can be fast and you might just keep seening their back, it’s a true compromise between ISO, shutter speed … and depth of field. The day after we flew from Kasese to Kisoro airfield to cross the Rwuanda - Uganda border on foot and reach the Virunga mountains at about 2000 mt above sea level. RWANDA: Arriving at Gorilla Mountain view was a total trauma with a rat crossing the hall and the discovery that it was overbooked for 3 out of the 5 nights that we were supposed to stay, a hopeless manager was nothing but sorry and totally usless, as the rooms asigned to us were under reconstruction. We then visit two more lodges in the area befeore Thousand hills, the local tour operator proposed Virunga Volcanoes, at about one our from the park entrance, but same altitude and with a beautifull view over theVirunga volcanoes and two lakes were sunrise and sunset are just fabulose. Travelling with my parents whom start to be "silverbacks", was a reason of concern into each an every treck that we did. However I am glad we did this amazing walks toghether into the rain forest on tracks, off tracks, up and down hills, volcanoes and into bamboo forest before seen the gorillas. Stinging plants, red ants are "part of the show" and a breif painfull memory once you reach your goal. 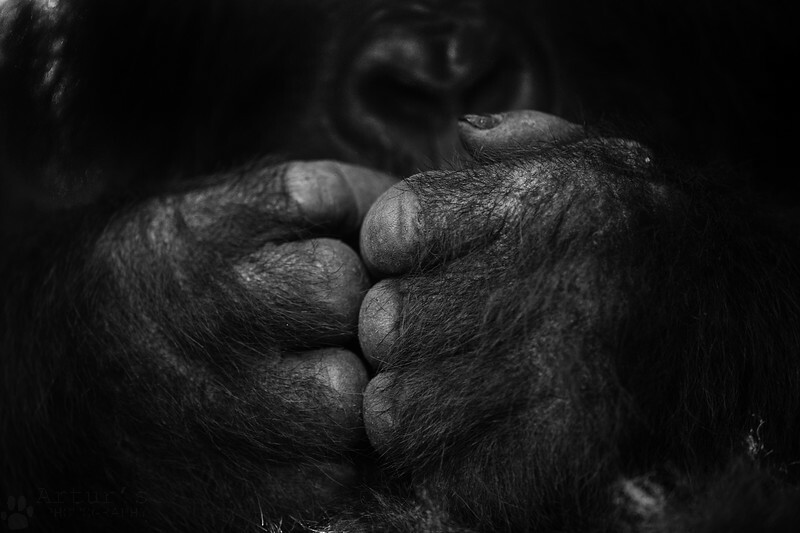 The calm, the natural gestures of the Gorillas is incredible, the curiosity of the babies and the playfullens of the sub adults is somthing that tuched us deeply. Each and every encounter with the Gorillas was different and special. The 2 hours treck with Francois to look for Sabynyo group and their silverback Guhonda lead us into Congo but it was unique experience as the Gorills recognized hima and interacted with their old friend and Ambassador. KIGALI is in clear contrast with the life out of town and in the rural areas, the differnet income per capita is visible and with its own existence eplains part of what happend back in 1994. A visit to the civil war/genocide memorial is a sad moment of truth that should be taken to rememeber and to walk into a brighter future. GEAR EXPERIENCE: A D4s and the D5 from Nikon where in my backpack for this trip toghether with a 24-70mm, a 70-200mm, a 2-400m and the 600mm , this last one was unnecesary almost all the trip and probably could have been left at home. Taking a picture of a black subject most of the time in the shade with white patches on them when the sun filtered from the trees was all but easy. Patience and lots of try and error on the way made the 24-70 and the 70-200mm lenses the most used ones thanks to their brightness and becasue no monopods and tripods are allowed on sightings. A bit of EV compensation suggested by Ian over the phone :) with a fix ISO, polarizer and more patience did the rest. SPECIAL THANKS: To Francois whom dedicated his life to the conervation of Gorillas and keeps guiding turist like us to increse the concervaiton awarness of Gorillas. To the treckers, the guides and the porters that helped us and will help you at each and every need. We thank them for the passion they put into their job, the conserveation spirit of the area and the respect they have for the Gorillas. To my parents and Nicoletta for have shared this experience toghether. To Ian for arranging the trip and Mwanzi that we met the last evening in Kigali, he is a man with great culture and a good sense of spirit. He and Thousand hills solved the accomodation issues with outstanding professionality. Thank you! The long awaited D5 finally arrived the first week of April and the eager to test it was so much that we decided to drive to the Racconigi White Stork Oasis about 45 minutes north of Turin. RACCONIGI WHITE STORK LIPU OASIS was funded in 1985 for the conservation of Ducks, White Storks and other birds at extinsion risk. In 1995 a wetland area was added so that today you can find 2 sections, one mostly a wet area to the left from the entrance with several observation cabins and one the right that can be devided in 3 areas, a smaller wet observation area with 2 more observation cabins, a couple of educational ponds and a third and last section that contains the nursery and a few cages for the protection and reabilitation of birds that suffered injuries. The visit can be easily done in two hours unless of particular sightings. Week ends are particularly crowded as faimlies take the children for a visit. The spring temperature and a slightly chilly wind allowed a confortable permanence in the observation cabins. GEAR EXPERIENCE: For a pure sake of comparison we took the D4s and the D5. The new Nikon features such as the AF with a 1.4x multiplier on F4 lenses were simply great. The camera despite the 150+ focusing points, lacks the microfocusing feature that the Canon top of the range have, non the less the 3D and the 9 focusing point clearly improved with the birds moving and branches on the way. On a continuous shooting mode the extra frame is very much welcome as it is also the continuous view while shooting. The D4s had a black fraction betewwen one shot and the other that the new camera does not :) . The extra Fn button on the body vs D4 gives further flexibility in personal settings that today was not necessary, but will become handy on safari. The 20mb pictures are a great plus from the previous 16mb of the D4s and allows also great hands free pictures without the micromovement that might happen with the D800 36mb. Looking forward to test the camera on lowlight and high ISO. Finally, be prepared to update your lightroom to 6.5 version on the Cloud version of it and Photoshop as the last and final update of the Camara Raw for Photoshop does not support the NEF files from the D5 without a longer process that to honest is a pain when you have to work on more than 1 pciture. SPECIAL THANKS: To Nital and Massimo from Photo19 (Brescia) for the super fast delivery and the experience sharing. 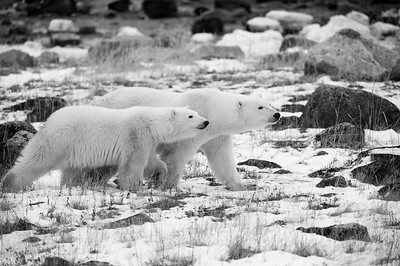 The quest for the Polar Beras "Mums and Cubs" started with a supersticious move, a flight a day earlier, to Winnipeg that ended up beeing crucial to "Gear Up" for the below freezing temperatures along the coast of the Hudson Bay. The Canada Goose Jacket, pants and the Buffin -100°C boots were hard to find as spring was approaching but were certainly essential as the welcoming temperature the day after on the Hudson Bay was -35°C. 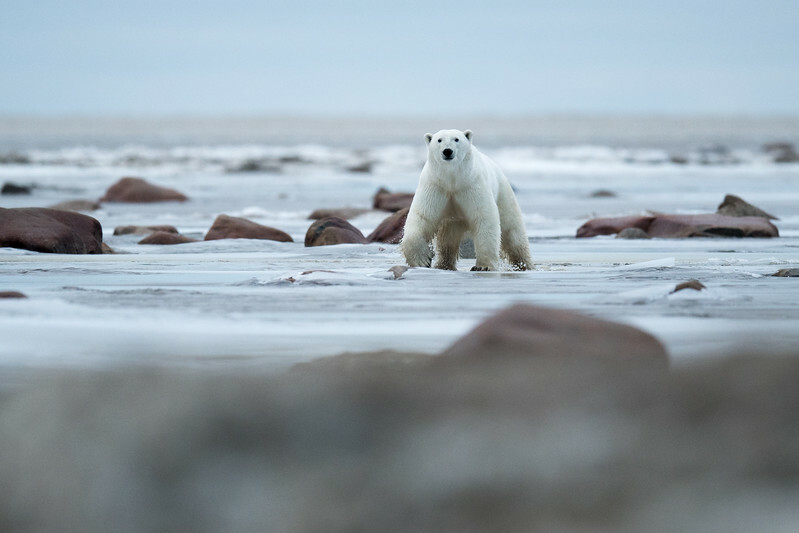 THE EXPLORATION TRIP, a first for Churchill Wild in the area at this time of the year was a special opportunity to discover the area and experience tuff photoraphy conditions. Typicall days saw first light at 5:15 am with people already "scoping" out of the greatly insulated windows for action along the coast. Breakfast at 8:00 with delicious bacon "The motor of Canada" pancakes and syrup and shortly after fully geared up so that not even a singl centimeter of skin was exposed, we head out on wooden Kumatics and motorskis to live the adventure and look for wildlife tracks and moving animals. Pick nic lunch and great dinners at 7:00 pm renergized the cold souls day after day some times minutes before the northern lights show. The enthusiasm of the first day at -40°C and the third day at -55°C with wind and srnow from the bay on super bumpy kumatics and motorskies did not fade out for a single moment over the twelve days. However we soon realized that task ahead of us was incredibly hard. We were there to look for Polar Bears along the cost, into frozen swamps over iced rivers with 6 mt banks from the Machichi River till the further point East, Cape Creek, and beyond; 80 to a 100km inland. The lack of footprints and marks let us figure that probaly the climate change (let me remind you the 20 degrees in New York at Christmas time) lead the Polar Bears into the dens too late last year and we were too early this year into the area that non the less captured our famelic attention and desire to find animals... we spotted Wolverine, Moose, Foxes, Grey Owle, Wiskey Jacks and White Winged Crossbill until Wolfs cristallized our focus. 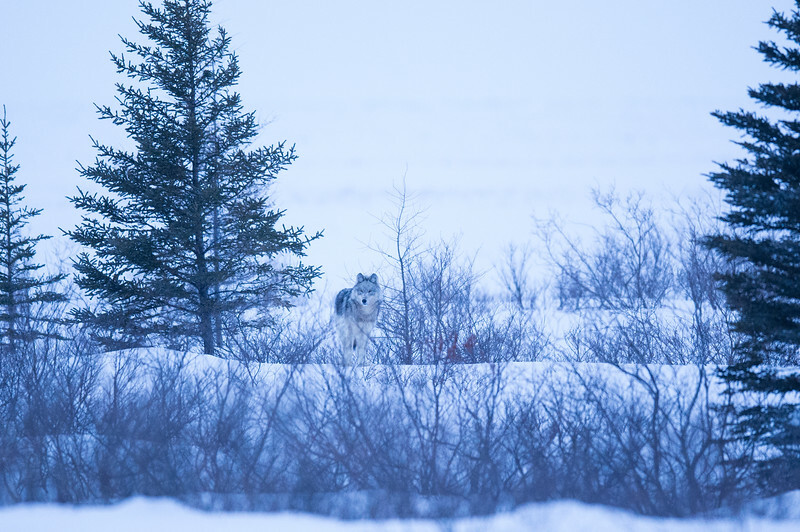 A wolf pack of more than 10 individuals siting on a Kumatic cruising at more than 60 km per hour was the apetizer to a dance between a pair of wolfs and us at sunset and sun rise. A few days into our expedition at the lodge a couple of wolfs started to come in at sunset form th rocky pack ice of the Hudson bay to the snowy shore in front of the lodge keeping their confort zone at about 400m from the windows until sunrise. The very last day, the wolfs decided to move in for the most spectacular close ecounter I have ever assisted with the species. They scanned the area and play for about half an hour before heading back to the ice. GEAR EXPERIENCE: Condensation between in and out was an issue, once out to avoid condensation inside lenses and camaras had to stay closed in bags for about 4 hours to avoid moisture once in. In the group there were Canon's and Nikon's. 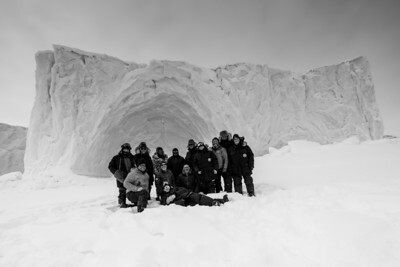 Both groups experienced difficulties 20 degrees under. Personally it must be said that the prime line of both brands fully tropicalized didn't left anybody down; D4s worked perfectly althougth the body was hard to hold at certain temperatures and breath moisture froze on the back screen most of the time. I personally can't say the same thing for my D800 that at -20°C and below experiences a delay in the selection of the autofocus red square area and at -30°C a jamming of the bayonet that does not lock in the lens with the release of the opening button. Gitzo Systematic GH5381SQR tripod head was a disaster, the different materials contract differently and the grease inside the head freezes unabling to use it after 20 minutes you are outside, clearly the worst performer! Not recomended for wildlife photography in the cold! One big advise, what ever you take out there it has to be prepared to resist to cold, moisture and vibrations. All expressed views in this blog are personal with sole purpose to inform and share experiences.